This is a slight change of pace for my blog, and I hope you find it refreshing. The four sites below are all finding success, but in their own ways. They remind me of the infinite possible approaches to becoming successful online and your approach doesn’t necessarily have to be conventional. If Facebook’s Edgerank algorithm has you flustered because your posts aren’t getting enough exposure anymore, you can draw inspiration from Jenell’s page. She proves it is still very possible to have a super active page in spite of all the changes Facebook made in the last year and a half. In case you don’t know, the Facebook Edgerank algorithm decides how long to show a post in the news feed and that is largely determined by the post’s engagement. The more comments and “likes” a post receives, the longer Edgerank will show it in the feed, thus giving it more exposure. Also, if your page has a history of solid engagement that will help too. A lot of people have complained that their posts are no longer getting many views, but you can drastically improve your exposure by posting more interesting, relevant content on a frequent basis. First of all, the page has 137,000 followers and 86,000 active users. That means over 60% of her “fans” are active. That is some outrageously solid engagement. 1. She has an assistant. 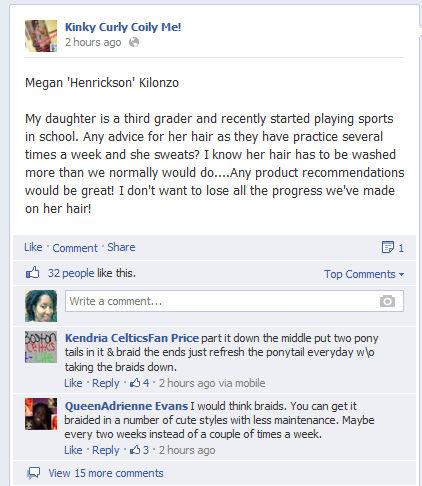 One of the keys to great engagement on a Facebook page is to post often. Having someone ensure your page is always updated will keep your page fresh and active. 2. She posts fan questions in her feed. I love this idea. Posting questions you receive not only relieves you from the pressure of having to respond to everyone, but it lets your community chime in. People love to give their opinions and this is the perfect way to give them that opportunity. Challenges are another awesome way of keeping your community engaged because it encourages people to come back and share their progress. 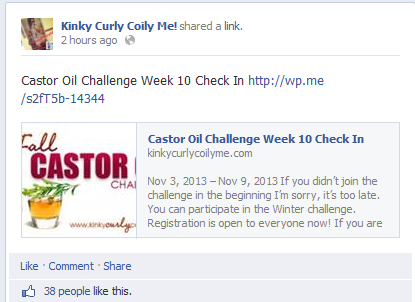 KCCM holds seasonal castor oil challenges. They are announced on her Facebook page and then she redirects people back to her site to officially sign up. I love that she uses her Facebook page to announce important events, but always directs people back to her website to participate. That’s the way to do it. Always train people to go back to your main hub that you own. Facebook may be “in” right now, but you don’t own the site and 10 years from now some other site may be the in thing. Always use social media to draw people back to properties you truly own. 4. She holds giveaways to grow her fan base. 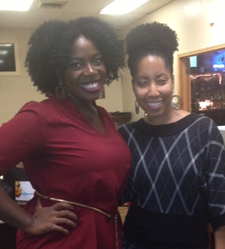 I attended one of KCCM’s natural hair meetups in St. Louis last year. At the end of the event she holds a sponsored giveaway and requires that everyone become a fan of her Facebook page before they are eligible to win. When I attended her meetup last year, I believe her Facebook page had roughly 30,000 likes. In less than a year she’s already increased her fan base by over 100,000. Amazing results! The Takeaway: Edgerank may have changed the game a bit, but Jenell’s page is proof that great exposure and solid engagement are still very possible on Facebook. 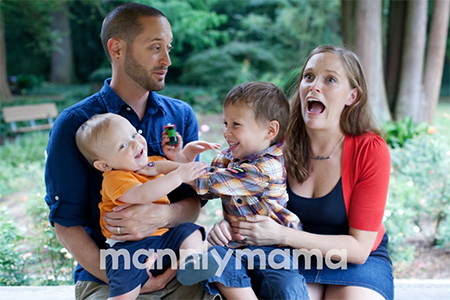 Her last name is Mann and she runs a blog that documents the happenings inside her household. I stumbled upon Brandy while browsing YouTube last month. First of all, I was drawn in by her site’s fun design and the playful photos. In many ways, her site stands out from the typical mommy blog. It started as a basic pregnancy journey for my family and friends. I was the first of my friends to be pregnant and I figured I would chronicle it for them. Through that I learned the power of the internet community and the therapy of writing. That first pregnancy ended in a miscarriage and I found sharing that story helped others….then that became a main goal of my blog. So how does Brandy promote her site? Complete word of mouth to begin with. On Twitter and Facebook I promote when I publish and sometimes will refer old posts to people with questions. My big spike in traffic came within the last year when my post of sleep regression got indexed really high in google. I didn’t write it for that reason but I am very happy that it is my top post. It embodies how I want people to see my blog…a place of real talk. Calm down and everything will work itself out! I also used to write for liberatingworkingmoms.com and got a good bit of following from there. I love their mission and love promoting them. Brandy told me that her site doesn’t make any money. That was never her goal. So why even mention this blog here? Because Brandy is having fun doing what she loves. It was actually quite refreshing because it seems you rarely hear about people blogging for fun anymore. Not to mention, so many profitable sites start out with the person just writing about something they really love. So the opportunity is there if Brandy ever wants to take her site to the next level. Maybe it’s just me, but isn’t there something refreshing about Brandy’s very organic start to blogging? It seems everyone launches a site today in search of money…. and they want to make it fast! It’s nice to see someone blogging simply because they find it fulfilling and enjoy connecting with their readers. The Takeaway: When you do what you genuinely love, things often happen organically. I never get tired of hearing stories about successful people who naturally stumble upon success because of enjoyment. Brandy’s site may not be making any money, but if she does decide to start monetizing, she already has a head start. If you’re struggling to find a topic, try to think of something that you would write about even if you weren’t getting paid to do it. You never know what kind of business may evolve from that. First of all, I love creative domain names that playfully convey what the site is about. Bon Appétempt chronicles Amelia’s various attempts at fancy schmancy dishes. I like how she balances instructional and personal information in her posts. The added personal touch infuses her site with personality and flavor (pardon my pun). Not everyone can pull off the personal side of blogging, but I think when you tie it into your niche and balance it with relevant information like Amelia does it is very effective. She also uses humor and a tad bit of quirkiness to present her information and it works. What I love most is that Amelia is not trying to compete with the professional recipe sites. She doesn’t need to. If you want to watch the pros, there are dozens of sites out there to read. Her site and YouTube channel are perfectly imperfect, and she’s carved out a nice little space in this niche with her approach. The site also made it on Time’s list of the 25 Best Blogs of 2012. The Takeaway: Nobody’s perfect and sometimes the most interesting websites are the ones that exploit those imperfections. That’s what makes Amelia’s site so relatable and genuine. Gavin Aung Than used to spend his days in an unfulfilling 9 to 5 job until he took the plunge to pursue his passion of cartooning in 2011. He decided to take inspiring quotes, combine them with his love for drawing cartoons and voila…. One way he monetizes the site is by selling his cartoons on Society6.com. To keep his fans engaged on Facebook, he requests that his readers submit suggestions. Obviously he cannot fulfill all requests, but completes the ones he can. It’s so inspiring to see people take their talents and creatively turn them into an online business. The Takeaway: Everyone has a skill or passion. For some, it may take a little more digging to discover and translate that talent into a successful website. Why Your Blog is Getting Ignored And What To Do About It! wow such an inspiration they are, the thing which really matters is just doing a bit more and as you said thinking out of the box, recently i felt nothing is impossible you need to think in a normal way which can grab anybody’s attention why not to try it on yourself before working on it and if it works well with you then it will do good. hey lisa very inspiring post,I love reading your post. I’ve been following your blog for a while and i love what you do and your post. this article was extremely informative and helpful for me. all four of these examples are inspiring for me. they make me want to work extra hard. thanks a lot lisa for your sharing valuable information. Great examples, Lisa! Love some of these blogs! They’re obviously doing some things VERY right. Love reading your posts. I had already jumped back into SBI as I thought after 3 years, I needed a refresher course. I’m taking new steps out of my typical box but into a hobby I have loved my whole life. I’m not a newbie when it comes to age! I know my topic but need to shrink it down about a foot. I am trying hard to keep up with your site, and website niches, SBI, and a stack of books. The books are pretty normal for me and I am loving all the other info. I so appreciate your posts and newbie help. Soon the website will come to me, and I will be off and running. Ok, a 61 year old doesn’t run far, but hurdles are a must! Hello, Lisa I have recently viewed your youtube video and becoming a follower of your work. I really appreciate this information. I am learning about myself as a woman, mother, student, christian and other things. This self discovery I am finding myself for the first time and learning what I like and don’t like. I am not sure completely what I love doing. I am going to school for Business with a concentration in marketing and have fallen in love with google plus, I love chatting with people and learning on the internet. I don’t want to do direct sales neccesarily but I love being on the internet so the idea came up to integrate both things so thats how I discovered your information. I recently just got set up on Blogger.com and trying to figure out what I want to blog about. I would like to get set up with google adsense but hope I am on the right track after reading this article. Some people blog just bcause as one of your examples expressed. I am not going to get rich right now but I figured as I learn why not attempt to try it out. I love everything from trying new products, reviews, youtube videos, positive quotes, etc so how do I integrate all of this. Can I blog about being a single mother and still use adds? Awesome content posted and inspirational stories from success blogs.. To much inspired after reading the blogpost.. Thanks for sharing great post..
Thanx Lisa for sharing valuable information. As usual Lisa,you made me start a new way of thinking for my website.. I think am gonna have to go freestyle n my blog and just post what I feel and how I feel it. Thanks so much for his post. Hey Lisa, very inspiring post. I’ve learned great things to be followed in life to be successful. I appreciate your work. Hi Lisa, since purchasing your book (I keep it with me at all times) you have inspired me to reach deeper within for my “why.” As an image coach, you inspired me to carve out a niche and stick with it… I have been blogging for approximately a year and enjoying the journey. Thanks for the book and catalog of resourceful posts. Hey Lisa, thanks for the inspiring stories and they make me want to work extra hard. I so love this post, Lisa! It’s just the bit of inspiration that I needed this morning. Great job showing variety because it reminds us that success can only be measured according to self-fulfillment. I’m just starting out, and I have to constantly remind myself to stay focused and continue writing because it’s my therapy and I love helping others. Many bloggers fall by the wayside when comparing themselves to others. And most times, this is without knowing the other person’s trials or story. But when we are comfortable in our own shoes, we are internally successful and we can, without a hint of jealousy, be excited about others’ success. So true about the comparisons! That will get you into trouble big time. Thanks for stopping by Angel. Lisa – your articles always trigger the “idea zones” in my brain! You serve up inspiration in consistently large doses – we the readers love it! I’d love to hear you thoughts on how to run a successful sponsored giveaway on a niche food blog (like mine). I have some ideas. I will try to PM you on your Facebook page. Great post, Lisa. I think it’s great that you changed things up with this post. All four of these examples are inspiring. And, bonus, lots of great tips on improving our Facebook presence. All the sites are literally superb and unique. I personally love ZenPencils and I normally visit it more than any other website (after my own, of course). THANKS FOR YOUR CONTINUED VERY GOOD TIPS! Very inspirational blog post, Lisa. Inspirational and encouraging for those of us who are finding our way outside of established means to keep pushing forward. There is always something to say and someone to be reached by our words. And that individual uniqueness is so necessary to build a community/audience of readers. Great examples of putting your own new spin on old ideas. I love how authenticity is displayed on each website. thanks Lisa. Marcus, that’s what I loved about all the sites. They all seem to be more than just content sites with paraphrased content — something that is way overdone today. Excellent way to explain how to simply have fun and potentially make money if you really want. THANKS LISA! Thanks for coming by and glad you found it helpful. I always grab something very positive from your post. Great post Lisa, and excellent examples. I’m looking for an inspiring kick for my next project and this has helped, cheers. Fantastic examples ! Great reminder that we must each decide what success means to us and consistently think outside of the box. Thanks for the inspiration ! I noticed slight changes about you and your blog and I love them. Now I am a bit upset that I don’t have the curly hair so I can get on that hair page but those girls are rocking it! Love the examples! Ive been following your blog for a while and I love what you do! This article was extremely informative and helpful. I have been on the fence about starting a blog and a Facebook page because of all the changes. I definitely have noticed that some of my favorite FB pages ( Like Natural Beauties for example) don’t get shown in my feed nearly as often as it used to. This is good information to know for the future. Thanks again and keep doing your thing! Thanks, Chrissy. Good luck to you!